The main Rapture screen. Tabs bring up the next Element or the Global page, while a simple mixer runs along the bottom. Cakewalk's latest virtual instrument takes traditional subtractive synthesis as its starting point, but offers a degree of flexibility that's unimaginable in any hardware instrument. Cakewalk have been making all kinds of progress on their synth front. First, they brought onboard René Ceballos from RGC Audio. He worked on Cakewalk's VA synths that were included in their DAW packages, and they are distributing his Z3TA+ (reviewed in SOS October 2005). He designed the Dimension sample-based synth, of which the newer Pro version was reviewed in May's SOS (www.soundonsound.com/sos/ may06/articles/cakewalkdimension.htm), and his latest effort is Rapture, which looks like the lovechild of those two soft synths. Visually, Rapture resembles Dimension, but it sounds and works more like Z3TA+. All three synths share the same SFZ multisample file format; this is relevant to several types of synthesis, but Rapture concentrates on wavetable synthesis. Not the PPG, Prophet, Waldorf or Ensoniq kind of swept wavetable, but single-cycle waveforms built from a table of data, producing a starting point for subtractive, analogue-style synthesis. Cakewalk are mighty proud of their so-called Expressive Engine and claim it is similar, in some respects, to an analogue oscillator. Be that as it may, Rapture doesn't look or operate like some of the more strictly retro analogue emulators, but does sound impressively free of digital artifacts. Many aspects of Rapture 's design are similar to Dimension, so I'll concentrate on the ways in which the two synths differ. First, there are six Elements, or voices, instead of Dimension 's four. Each Element remains a complete synth voice in itself, with a full complement of keyboard mapping and sample controls in the Oscillator/Editor section; DSP for filters and drive; Modulators for envelope generation, LFOs and step-sequencers; a three-band parametric EQ; and your choice of insertable effects complete with yet another filter. The Modulation section takes up most of the screen real estate in Rapture, and most of the work gets done here. 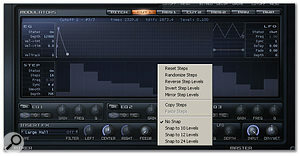 Keyboard shortcuts can facilitate getting around between the modules.There are few differences in the control mapping section: since Rapture concentrates on wavetable playback, some of the more sample-oriented options are missing, but a Phase amount is added, so you can twist the starting phase of a sample, and a Quality option which lets you switch between standard and high. Rapture, being more 'synthy', also includes a Multi function where you can choose between three, five, seven and nine unison voices per Element. These fattening oscillators are simply switched on and automatically panned across the stereo field for extra oomph from a single Element. Think of each step as adding two extra patties (with cheese!) to your single-voice burger order. For even more obesity, there is a Detune control which operates by cents — up to 100. 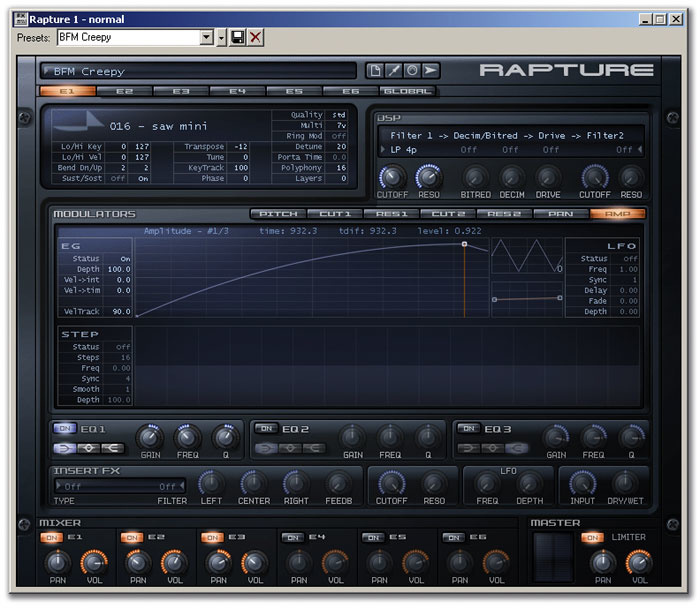 Many synths include a 'super-saw' setting; Rapture does the same sort of thing with any sample you load. And it can do it with each of the six Elements. Talk about supersizing your sonic menu. An alternative to the Multi function is the Ring Modulation setting, which creates a second oscillator, with Detune controlling the amount of the effect. If you must have Ring Modulation and Multi, you can right-click on an Element button and choose Ring Modulate Previous Elements. This doesn't allow a single Element to do both, but uses one entire Element to ring modulate the previous ones. Most ring modulation uses a simpler system where one oscillator modulates another prior to the envelope generators, filters and so on, so creation of very rich and evolving timbres is possible with the Rapture method. The final difference between Rapture and Dimension is portamento. You could always program in portamento within an SFZ file, but Rapture has a controller for it. Unfortunately, however, this isn't polyphonic portamento — you have to set the Polyphony to zero for it to work. Still, it is something I sorely missed in Dimension. 1.3GHz processor, 512MB RAM, 256MB hard disk space, screen resolution 1024 x 768, 16-bit colour. 1.2GHz G4 processor, 512MB RAM, 256MB hard disk space, screen resolution 1024 x 768, 16-bit colour. Mac OS 10.3.9 or higher. The Filter/Drive section of Rapture contains the same components as its counterpart in Dimension, but is more flexible, with two filters in series instead of Dimension 's single filter. The decimator, bit reducer and drive each have an on/off switch (plus drive type), and their order can now be cycled through by right-clicking. I suppose it would be more flexible to be able to drag the order and if the filters could be switched to parallel, but what you have certainly already provides a wealth of choices. The filters are very good — René has always designed very analogue-sounding filters — and there are certainly enough types. They start with low-pass, one-pole filters and progress up to high-pass, six-pole. In between there are one-pole all-pass and two-pole band-pass, band-reject and peak filters, plus 'pink' and comb filters. The Global page can access filters through the Effects and has a stereo step sequencer too. If it only had an EG and LFO, you'd have a complete modulation section before output.The Modulators can control both cutoff and resonance for each filter, as well as pitch, pan and amplitude. The envelope generators and LFO are basically taken from Dimension; you create envelope breakpoints by right-clicking in the graphical display, while the LFO contains all the usual controls. You can also add your own LFO shapes simply by naming mono WAV-format files consecutively from 20 to 99 and putting them in the LFO folder. 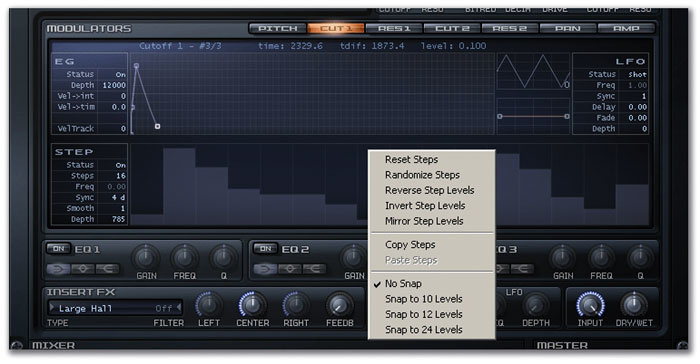 These files can be of any sample rate and length and can certainly add texture to your bag of LFO tricks. However, the LFO rate control barely gets into the audio range (its fastest setting is 40Hz), so clangorous FM sounds can't be achieved this way. Keytracking works the same highly ergonomic way in Rapture as in Dimension: dragging either side of the segment maps the effect to the destination according to MIDI note numbers. There are a few tricks here, but it mostly works as you would expect. Finally, each modulation destination has its own step sequencer in addition to the more standard EG and LFO. You can specify a number of steps from two up to 128, choose whether you want it to sync to host tempo, apply smoothing at the step boundaries and control the depth to which it modulates its destination. One trick with the latter control is to use the Ctrl key (on a PC) to move by hundreds, rather than single digits — since the range of the Depth control is in the thousands, this can save a lot of wear and tear on your wrist and mouse. Setting up a sequence is easy: not only can you 'draw' in your steps, but right-clicking on the step area brings up other choices allowing you to randomise, reverse, invert and mirror the steps. You could, for instance, come up with a pattern for the filter cutoff, copy it and paste it into the step sequencer that controls the same filter's resonance, then reverse the steps, creating an instant geometric relationship between the two. Last, but too cool to be least, you can use a keyboard to enter in MIDI notes for the pitch step sequencer. The three-band EQ is the same as in Dimension, with an on switch, buttons for low-, band- and high-pass, and full parametric controls. It is, of course, great for adding that final touch to a sound. Finally, Cakewalk have added a few extra insert effects. All the Dimension effects are there, and Rapture adds more choices in the size of halls for reverbs, as well as two kinds of distortion. By default, each Element has its own EQ and effects, but if you want to use the same effects on several Elements, you can go back up to the Element buttons and, instead of choosing to ring modulate the previous Elements, choose Chain To Next Elements and share the effects. This also, of course, saves on CPU cycles. Finally, instead of hitting an Element button at the top, you can click on Global and bring up the final page. There are the two global send effects and a global step generator, plus master EQ and insert effects. The global step generator is actually two sequencers, one applied to each stereo channel's volume, so you can have lots of fun using it for auto-panning effects. The world of soft synths is pretty crowded these days, although Rapture offers more flexibility than most. Among the innumerable other options, one that stands out is Virsyn's Tera 3, which now allows you to use your own samples as oscillators, and offers lots of other nice features including the additive Spectrum Oscillator. Compared with Dimension, Rapture is more of a synth than a sampler, and the presets reflect this. Cakewalk are marketing it at the trance/electronica market, which provides an idea of what kind of presets you get. First, all those missing organs in Dimension must have been donated to Rapture. There is a Keyboard section that has about 75 presets listed, and that doesn't include the various organ-sounding presets in other folders. A lot of these are dirty, gnarly, nasty sounding Hammonds: I was very fond of 'Jimmy, welcome to the show (mv)'. It is one of those digital patches that responds like an analogue animal — unpredictably. Hit a single note and it sings. Hit a second note and, depending upon the octave, the range between them, the time of day and relative humidity, you get an organic interactive growl between notes. More like a beat-up tonewheel organ at the back of a bar rather than some pristine bit of numerical coding. As you move the mod wheel (mv) up, the vibrato lessens and the interaction becomes more obvious. Funky, but it seems to work. The biggest missing piece of the preset puzzle seems to be straight analogue emulation. With the emphasis more on dance sounds, a lot of the meat and potatoes of the analogue world aren't available at the touch of a button — you have to get them by programming. However, all the essentials are there, and programming support is already starting to appear. One of the complaints about Dimension was that information about it seemed to be scattered all over the Internet — some at Cakewalk's site, other stuff at RGC Audio and other sites. Cakewalk seem to be making a concerted effort to address this problem, with a new Instrument forum at their site and a spot for users to exchange presets as well as ask questions of staff. No doubt there will be a lot of analogue and other favourite programs posted here. Which is good, since Rapture covers more ground than any virtual mini-me-Moog or ARP-me-up-an-Odyssey. Though it may not replace a virtual modular synth, it can come close and is easy to program. It helps that I've spent a lot of time with Dimension, so the transition was easy, but Rapture appears to be well-designed for easy sound creation. Most of the work is done right in the middle of the synth screen with the modulator section. The area is big, and it is very easy to work on the EG and Step Generator. Unlike vintage emulations, which often share the same filter, EG and other modulators between two or more oscillators, each Rapture Element contains everything, so it is nice that you can copy and paste control values within Modulators or between Elements: not as CPU-light as sharing, but not much slower once you get used to it. I did find myself wishing for a master EG, though; smoothing the master step generator is a substitute, but a full envelope section would simplify Rapture. About the only other complaint in this area has more to do with organising all the available control. It would be nice to expand the Element section to see more than one Element at a time while working on them. The same goes for Modulators — it would be nice to balance the same filter's cutoff and resonance from the same page, rather than switching. I'm not sure how that could be accomplished without causing even more problems, but such design fabrication is above my pay grade: I just know what would make my life easier. There are, at least, plenty of keyboard shortcuts to help navigate around the screen. The numbers (above the QWERTY keys, not the keypad) can cycle through Elements or Modulators, depending on which is in focus, and the Ctrl key performs various functions. 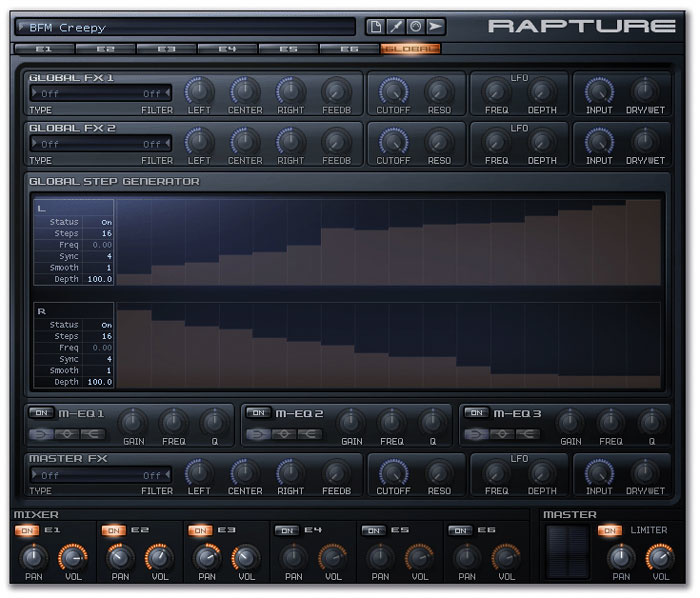 So is Rapture the synth to carry you away to sonic heaven or will it just leave you behind? No one synth is the answer for everyone, but Rapture can certainly answer most synthetic prayers, and there are scads of features I haven't even touched upon. There is the 24-slot Modulation Matrix. There are 200 tunings using Scala files that come with Rapture, and thousands of others you can download, plus the software to make your own. Right-clicking on any knob brings up a MIDI Learn function, so it's a doddle to use with hardware controllers — the five assignable knobs on my keyboard just doesn't seem like enough any more. 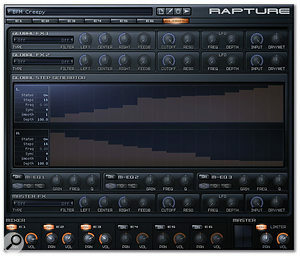 Rapture is quite different from a standard virtual analogue synth, though it will, of course, do analogue emulations. The filters won't self-oscillate (how many digital filters do? ), but still manage a good job of capturing the girth and edge that analogue filters have. While you are not likely to use all six Elements at once, it is better to have them than miss them; there is a CPU hit with so much going on, but it seems no heavier than any other high-quality synth or effect. Besides, if the hit is too much, that just gives you another excuse to upgrade your computer! An easy-to-program entry into the sound of subtractive synthesis. Flexible step generators offer lots of possibilities. Anti-aliasing engine allows you to use sample-based waveforms as a basis for analogue-style synthesis. Though programming is mostly easy, there are still a few areas that could be improved. More global modulators could streamline the sound-creation process. Cakewalk's companion soft synth for their Dimension sampler looks and operates much like its cousin, but the emphasis is on synthesis, not replicating acoustic instruments. The sound is very clean, and the design strikes a nice balance between ease of use and depth of control.